Earlier we heard Dr. 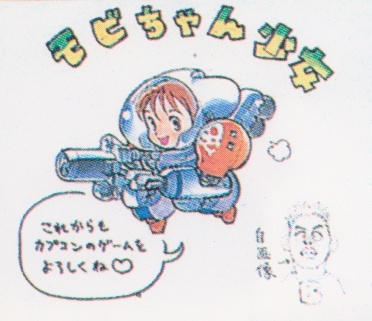 Right explaining the origins of Capcom’s arcade mini-mascot, and just this week we saw Mobi-chan hanging out in the Capcom Secret Laboratory report on Rockman 2: The Power Fighters (which incidentally, Mobi-chan appears in as bonus item). Now check out Mobi-chan as you’ve never seen before: unmasked to reveal a cute girl inside! Art by Bengus, who knows you can never get enough of girls in mobile combat suits. Please continue to support Capcom games (or she’ll have to hurt you)! 6 Comments to "The Adorable Mobi-chan Girl"
Is she actually a girl? (Samus, anyone?) I have read stuff over the years saying the character’s name outside of Asia was Henry, uh, suggesting…this was…not the case. Perhaps, I’m mistaken? Is this another 80’s “let’s-make-the-female-character-a-man” tactic? S’far as I know, the original Japanese release of Side Arms named only the suits themselves, Alpha and Beta. The actual characters inside were left nameless for the player to infer their own identities upon them. Guess Henry and Sanders were stock Western heroic names to give them more personality stateside. Later after they became popular cameo characters, the white Mobi-chan Alpha was named Mobinosuke and the red Beta version was called Mobitta. Those only refer to the super-deformed cutesy variants though, not the actual normally-proportioned game protagonist characters who shall probably remain nameless in Japan (until the Bionic Commando style remake). In answer to your actual question, I think this pic was just pure fan service. Without knowing exactly what’s under the suit, the possibilities are endless. Probably just something Bengus thought he/we would like to see. This afternoon I decided to check out Gamest’s 1991 All Capcom book where I remembered reading about Mobi-chan’s name a while back, and I saw that Henry and Sanders are indeed the names of Alpha and Beta’s pilots in Japan as well! (I should have checked there yesterday…) So, I stand corrected. It also occurred to me that Henry and Sanders both sound like last names, and therefore may not denote the characters themselves as being male or female. So who knows, maybe they could both be ladies after all! Skewing off a little bit here, but Magweasel did a writeup of Side Arms last week. I had no idea Kevin G was updating again! Sweet.